I DROPPED THE SAW AND THE MAGNESIUM CASE BROKE. IM A LITTLE DISAPPOINTED. ONLY 18 MONTHS OLD. IT WORKED GREAT TILL THEN. My old Sears circular saw had a base too small to fit on my new EZ Fence saw guide, so I started looking for another one that had an integrated saw dust collection system, blade brake, and laser guide. I only found three saws on the market, Sears, Festool, and Porter Cable even had a dust collection system The Sears version had a laser included, but I figured unnecessary with the guide. It also looked a little "cheap". The Festool was nice, but too expensive. 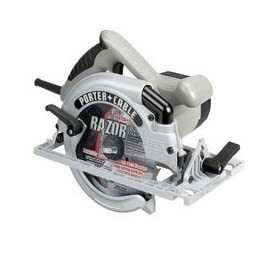 Based on internet recommendations I decided on the Porter Cable 324MAG 7 1/4 inch 15 AMP circular saw. The saw is nice and light, cutting through 3/4" plywood effortlessly with a new blade. The tool free blade change makes blade changes a snap, but requires a little practice. However, eventually you will have to get a conventional blade bolt from Porter because the blade will loosen up. Porter provides this free under warranty. The saw dust collection nozzle, interestingly, is on the front of the saw. I suppose this helps capture more dust as the blade is forcing the saw dust up the nozzle as it rotates. The position does take some getting used to, as you have to curve the dust hose around the saw to keep it clear of the cut. You can leave the hose leading out ahead of the saw, but you have to stay more alert to it's position. The dust collector does seem to catch most of the dust, as I had less than one dust pan full after cutting up two full sheets of 3/4" plywood. I am very pleased with this saw. It works quite well with my saw guide and makes nice cuts in heavy material effortlessly. EZ Guide now has a saw base specifically for this saw. I was thinking about buying a cheapo saw...a 40 dollar special at the Home Depot...but I decided this would probably last longer, and cut smoother. So far I haven't been dissapointed...It's a great saw, works wonders on anything and everything it goes through. I agree the blade it comes with is best left for framing, but it does seem to be a better blade than many that come with the saw...And it came with two of them, which was nice. One I try to keep nice, and the other I beat the snot out of. All in all, not a bad saw...Hopefully it will keep on going. The saw is nice and light, cutting through 3/4" plywood effortlessly with a new blade. The tool free blade change makes blade changes a snap, but requires a little practice. I bought this saw with some reservation to replace my existing Porter Cable 347's. Those saws were my favorite and I could no longer find them anywhere. I was pleasantly suprised that the saws power and design did not let me down. It appeared bulky from the pictures but the actual saw gaurds and the such are not intrusive like I thought they would have been. The basics are the same as the trusty 347. Nice substantial magnesium base, light weight, lots of power etc., but the subtle improvements (angled cut to the base, built-in sawdust deflector, rubber handle, to name a few) are very nice, making this saw a joy to use. I had been looking to replace my old sidewinder, and found this remanufactured saw to be an unbeatable value. I love the saw and only wish it came stock with a rip guide. 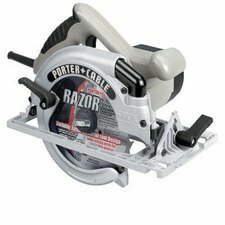 I found the Porter-Cable 324MAG Circular Saw to be a great work horse. Plenty of power and light wait for use all day. The quick release feature for the 7-1/4-inch blade makes life easy. The guide and plate are very accurate. I've used many different brands of circular saws but I find this one to be a gem. I have used porter cable saws for thirty years and this saw has been good until I dropped it and cracked the saw guard at the narrow, unreinforced point by the nozzle. It's junk now. I'm amazed that the engineers couldn't have realized this would happen. The saw is practically broken in half and won't cut a straight line for the life of it.